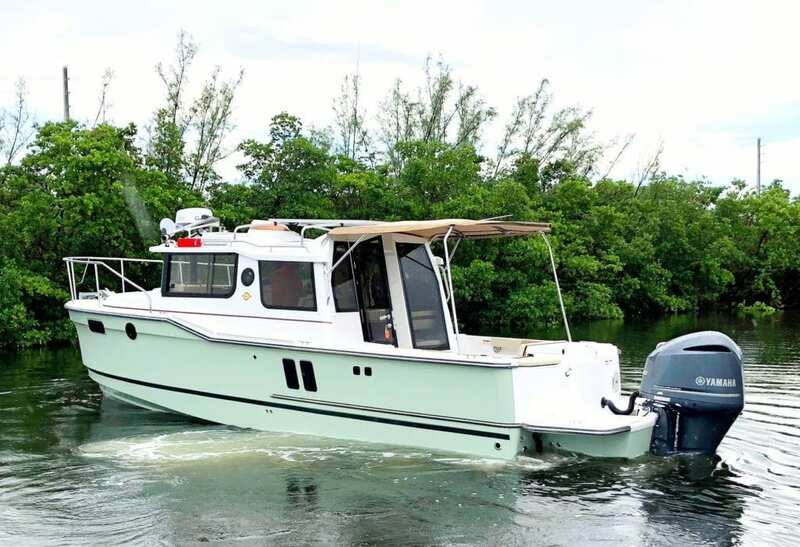 Cruising without compromise is the name of the game for the all-new R-27 from Ranger Tugs. It has the amenities and performance you want for comfortable coastal cruising. Powered by the efficient and popular Yamaha F300 outboard motor, the new R-27 doesn’t waste time delivering you and your family and friends to your next adventure. With a top speed of 20 knots, a high cruise of 15 knots, and an economical cruise of 8 knots, the R-27 is well suited for you to cover distances when time is of the essence, yet still want the option of cruising for long periods at slower speeds. You enjoy peace of mind knowing that the included Garmin 7612 Chartplotter will guide you safely on your passage and that when you arrive, the bow thruster will make docking a non-event. The curved front windshield and overhead glass atrium provide beautiful 360 degree views and generous light throughout the salon. For cruising couple, accommodations include a forward cabin. If you want to bring the grandchildren along, there’s an aft berth too, which also functions as a nice stowage space when the kids stay at the dock. Open the aft glass bulkhead in tandem with any of the hatches, windows, or port lights to deliver a fresh breeze throughout the cabin. With options like the solar panel and water maker—and with a well-stocked freezer—you can go off the grid and explore to a heart’s content, touching a marina every so often for a shoreside meal. The layout also includes a mini office that’s a great place to map out the next day’s run. When taking into a gorgeous sunset, you and your family and friends can enjoy the view from the spacious cockpit or from the new double lounge seat on the bow of the R-27. The R-27 is a turnkey package complete with all the stuff, and ready to tackle your next coastal adventure. All aboard for the best voyage ever!